We have another black male chow in rescue. He is a young boy who turned 1 in July, verified by its surrenderer at the shelter. We do not have any current still photos of him at this time. However, we made a video to help us find a foster home, of which he is currently chillaxing at his fosters. Please network his need for a new forever home for us. Once he is ready for adoption, we will be accepting applications (from local San Francisco Bay Area homes only please). Last edited by Loup Garou Rescue on Fri Mar 22, 2013 1:28 pm, edited 2 times in total. 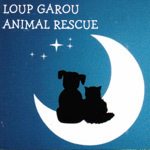 Loup Garou Animal Rescue, a rescue partner of NORTHERN CALIFORNIA FAMILY DOG RESCUE, is a 501(c)3 registered non-profit organization, dedicated to the rescue & rehoming of black and dark coated companion animals in the San Francisco Bay Area. Happy Kissy Guy is ready to go to a forever home!!!! Last edited by Loup Garou Rescue on Sun Dec 02, 2012 9:31 am, edited 1 time in total. If you rescue another black chow chow like this beautiful boy, we will drive to San Francisco from Los Angeles. We have a gaping hole where our beautiful black chow chow girl was as she passed away after twelve beautiful years of loving us. We rescued her from our alley in Chicago before moving here, and she was shy and broken but the most dignified creature I had ever seen. This boy look much like her. She was about 65 pounds with a slightly longer face, so some thought she was mixed, and she looked like a cross between a huge furry bear and a regal lyon. So, please remember us? Thanks. A beautiful house in the foothills, an academic who took her to all of his classes and incredible pampering awaits. Just a reminder. Midnight enjoys his stay at his fosters but he still needs a forever home! I want to say Thank you to Jenn and everyone at Loup Garou for all that you do. It truly comes from your heart. We adopted Midnight last weekend and we are IN LOVE! On the heels of the adoption, our Chow Border Collie, Bubba Jones could no longer stand and to hug him hurt him. He loved Midnight but I felt horrible guilt because he was in so much pain after 13 1/2 years, he had to go to doggy heaven and his free spirit now roams the stars. Jenn and Linda both sent kind words but it wasn't until the following morning on our morning walk that Midnight came to life when I told him he was "such a good boy." My tears turned to laughter watching his silly enthusiasm and in that moment I knew that he came to us at just the right time and that Bubba Jones had blessed this! He is a giant, sweet, sweet baby that the shelter had pink slipped. He is anything but viscous, he is simply sensitive and chows must be respected, just as people. Momma's new love. Blessed by my angel, Bubba Jones. Hooray for Midnight. It took a little time for Midnight to find his "home" but it was well worth the wait for him. The good thing about Midnight is he really wants to please. He was never ever vicious, just scared and confused at the shelter and looking for someone to trust. Now that he has "his" person to bond with he should blossom even more. Jocelyn, I hope you and your family have many happy years with him.